It’s pretty easy to explain Oklahoma’s OSHA training requirements, because they don’t have any. Oklahoma does offer the OSHA free consultation service, which allows employers with 250 or fewer employees to have a consultation that is not an inspection. The consultation will point out things that might create a problem during an OSHA inspection, and makes recommendations for changes to make sure that the company is compliant with Federal standards, which of course apply just as much in Oklahoma as anywhere else. 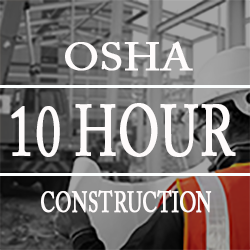 The 10 Hour Construction Training will prepare you to start immediately on public work projects in Oklahoma or any construction job in all 50 states. Upon completion of our online courses, you will be able to print a temporary certificate of completion. You will receive the Department of Labor OSHA Wallet Card in approximately two weeks. If you work with the ODOL (Oklahoma Department of Labor) they can sometimes secure for you a 2-year exemption from any Department of Labor OSHA inspections. Looking for OSHA Offices in Oklahoma? Check out our Oklahoma OSHA resources page.